Today is the final day of my journey. It seems strange for it to be coming to an end. Many of my friends from Spokes East Kent Cycle Campaign met me outside the Greenwich Foot Tunnel this morning and we cycled back to Canterbury together. The journey’s pace was a bit slower than usual to accomodate group cycling. We ended up in Canterbury in the early evening after a thoroughly pleasant day cycling. Well the weather was cooler today, but it was also quite breezy at times. Nevertheless the cycling was quite relaxed, especially once I’d made some progress down the Lee Valley to the point that I’ve cycled several times before. 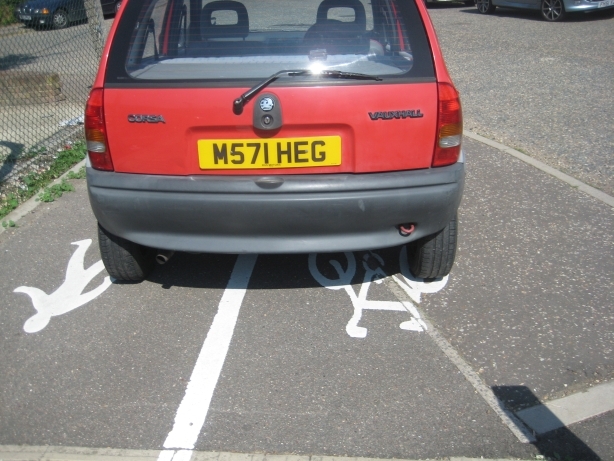 Cycling through Harlow was easy, but leaving was more difficult. Beside the A1169 there’s a cycle path that goes on for quite a while marked with with National Cycle Route 1 numbering, but following that effectively doubles back on the cycle route I took through the town. The path appears to abruptly end at the junction with the A414. I’m tempted to say that the signing is a mistake, I think that perhaps only a small part of it was supposed to be signed with NCR1 numbering, but that the constructor signed the whole of it. In the end I just cut across towards the Lee Valley Park where I knew I should pick up NCR1 again eventually. I found it again at Dobb’s Weir. The last time I cycled part of the Lee Valley was just past Easter, when I cycle-camped from Fishguard to Canterbury as a warm-up to this trip. 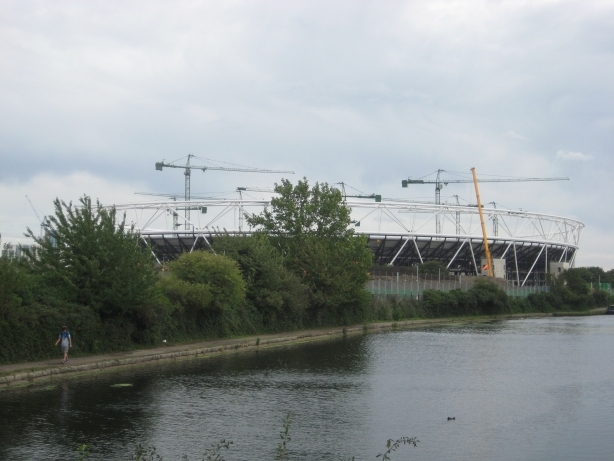 Since then quite a bit of progress appears to have been made at the Olympic Park site. The stadium appears to be taking shape and it’s great that it looks like it’ll be so easily accessible from NCR1. I got down to the northern side of the Thames and took a short break, and it’s lucky that I did. I’ve crossed the Thames four times, including today, via the Greenwich Foot Tunnel this year and all four times one of the lifts has been out of action. So, once again, I needed to carry my bike, loaded with four panniers, a rack bag, and a handlebar bag up the flight of stairs. Luckily I’ve got a day to relax now before the final journey home to Canterbury on Saturday. It’ll be great to meet up with several friends for the cycle back down on the last day. The weather’s pretty warm at the moment, so I’m having to buy lots of drinks. Hopefully it gets a little cooler over the next few days, thus making the cycling more enjoyable. Today’s leg was pretty short, but I managed to stretch it out to all day by adding in some detours and just going at a leisurely pace. First of all I surveyed the link from where I left NCR13 yesterday to NCR1 in Colchester. Then, on the way out of Colchester, I felt the urge to map a brand-new cycle path through a housing estate, because that’s a level of detail where OpenStreetMap excels. I also mapped some other cycle paths on my way out of Colchester, then finally left for the countryside. Many miles later NCR16 connects with NCR1. I’d noticed this when browsing OpenCycleMap the other night, but by following NCR16 I think I may have extended our NCR16 slightly further than at present. There should be some more too, but I stopped at the point where two signs seemed to conflict with one another. Whilst trying to find any traces of NCR1 in Maldon I came across an inconsiderately parked car across the start of a segregated path. Unfortunately this is far from a unique experience. In Chelmsford this evening I discovered a turning signposted as NCR13 which I only followed for a few metres, simply because I thought it was already mapped. Looking at OpenCycleMap just now though I can’t see it, so I may go back tomorrow to follow a little more of it before my journey along NCR1 into London. My planned route today was to follow a small amount of Regional Cycle Route 30, but then branch off to find some more portions of National Cycle Route 13 (A route still under much development). However, I’ve made good progress over the last few days and know that we still need to map large portions of RCR30, so I took a more lengthy detour to Diss to follow the route a bit further before retracing my steps back to my planned route. During the detour I met another cyclist en-route to Diss and we got chatting for the journey, and then the return route, where I was invited back for a welcome drink. I picked up a couple of sections of NCR13 that we haven’t got mapped so far, and some of this wasn’t where I thought it may be, but I followed it anyway. 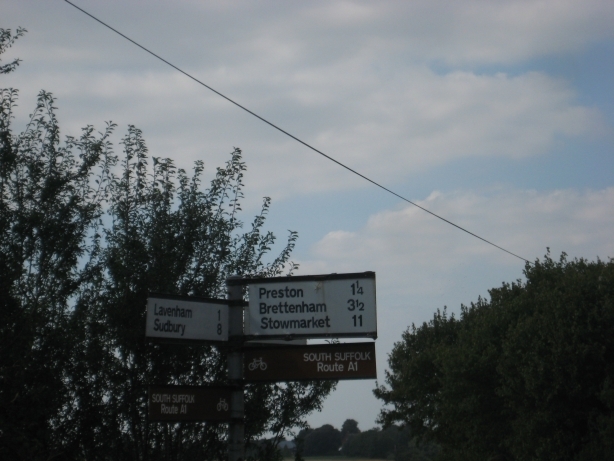 I also stumbled upon a portion of the National Byway, South Suffolk Route A1 and South Suffolk Route A. So, a fruitful day in finding unmapped cycle routes. There are still plenty of bits of these routes still to be covered though. In all I cycled 22 miles more than my original plan, so I’m already well in excess of the total mileage I’d planned for the whole trip. Today and tomorrow form my other major diversion from National Cycle Route 1 on the way back home to Canterbury. After a little portion of NCR1 out of Fakenham I soon met up with NCR13. Nearing Thetford Regional Cycle Route 30 also joins. Making good time I decided to follow this away from my planned route for a few miles in order to get it placed onto OpenCycleMap. I then retraced my steps to go into Thetford. The signing is slightly less clear for both NCR13 and RCR30, but there’s enough to work out the way; it’s mainly just that signs are poorly oriented to be visible on the approach to junctions (they’re fine for when you actually at the junction, but that’s too late for selecting your road position.). My plan was to follow RCR30 out of Thetford towards my accomodation this evening, but first I followed NCR13 some more through Thetford before retracing back to where RCR30 diverges from that. Unfortunately I forgot to put my camera batteries on charge last night, so I’ve had to note my Thetford detail via points-of-interest on my GPS. This means I haven’t managed to get road names here, seeing as many of them were longer than the 14 characters supported by my GPS, drawing a paper map would have been too much trouble this time. I’m sure that it won’t be too long until somebody else adds that level of detail. Nearing Thetford the route uses a track which is also used by the Peddars Way long distance path. 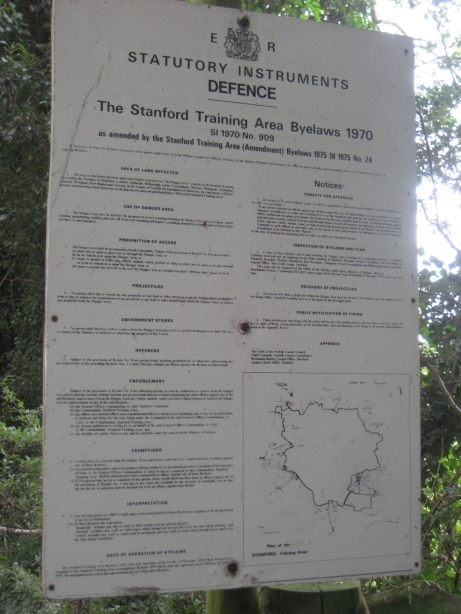 This skirts the edge of the Stanford military training area lined with notices every few metres warning the general public not to enter together with a long list of byelaws. I’ve discovered something interesting (or at least I think it’s interesting) about the reference numbers for the postboxes in the Norwich (NR) area. All 14 of the postboxes I surveyed in this area repeated the digits from the outward portion of the code as the prefix for the latter portion of the code (e.g. NR16 1647). This is the only postal area that I’ve noticed this on, after having surveyed postboxes throughout the duration of this trip. After starting out on the flat I got some hills back today and was glad for it. It adds more variety to the ride and cuts down the wind. It was a bright sunny day and pretty enjoyable. On the way into King’s Lynn NCR1 meets NCR11 for a short while. It also meets RCR30 for a brief moment. I cycled very short stretches of these other routes to make sure that they’re marked on the map, but I’m pretty confident that we’ve already got the portion of NCR11 that I saw. I also met RCR30 late in the day, again briefly, so marked that as well. The route today involved two large estates. Country estates that is. First of all there was Sandringham. 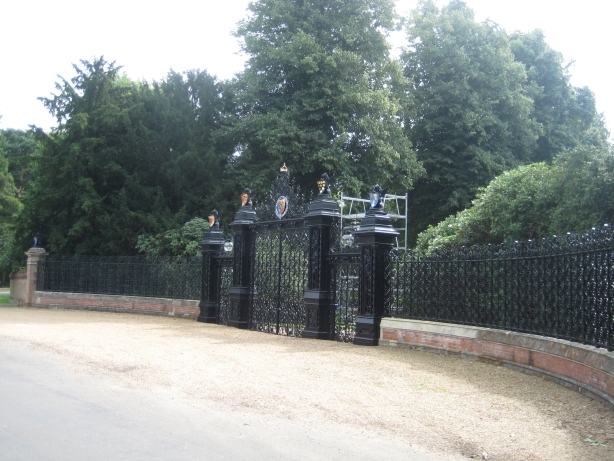 The cycle route skirts the edge and you get to see some fancy gates in the process. 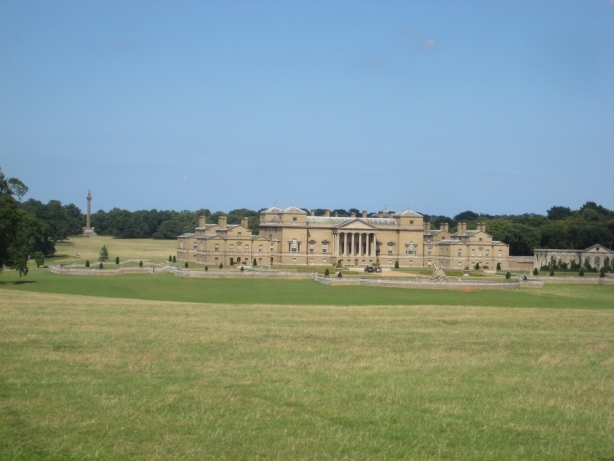 Then, many miles further on, there’s the option of passing straight through the middle of Holkham Park by choosing the Wells Loop braid of NCR1. As it happens I decided to cycle both braids for completeness though. 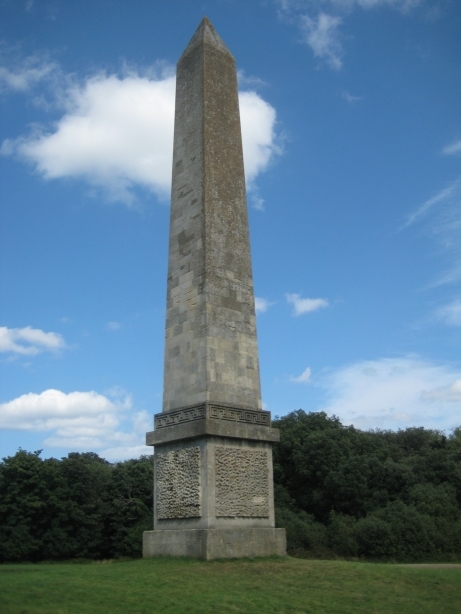 The cycle route in Holkham Park passes straight past both a large obelisk and Holkham House. 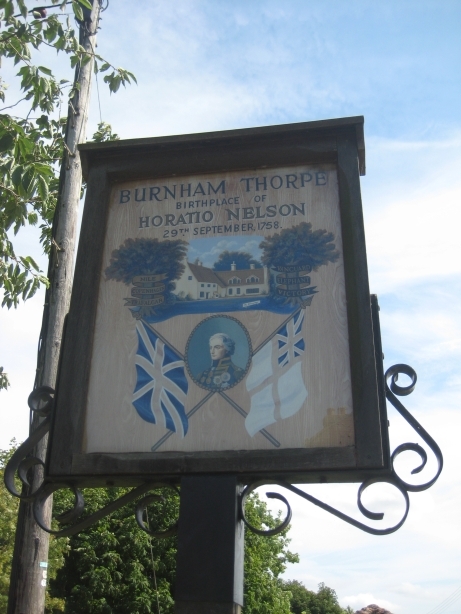 Today’s route also passed through Burham Thorpe, the birthplace of Nelson. Not surprisingly the local pub is named after him and the village sign proudly states the village’s heritage. 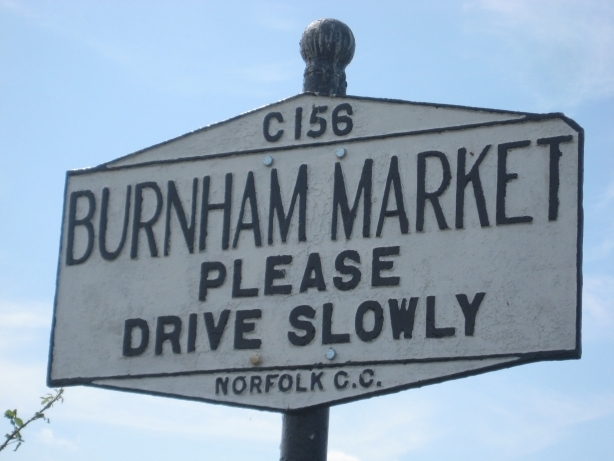 Slightly earlier, on the way out of Burham Market, I had the fortune to spot a sign that gives the C-number of the road I was travelling on (C156). As those in OpenStreetMap know from experience first-hand evidence of C-road references is rare — this is only the third one I’ve seen, the other two being in Surrey. The route today was extremely flat. Indeed my plans show a cumulative climb of 40 metres for today, whereas it was about 1500 metres for the day I climbed into Dartmoor and that was considerably shorter. Just because it was flat doesn’t mean that I was fast though. Flat allows strong winds and I had both headwinds and crosswinds with the occasional following wind. I managed to pick up a decent pace (peaking at 22mph) in the sheltered areas, but these were rare. There were several interesting churches along the route today. 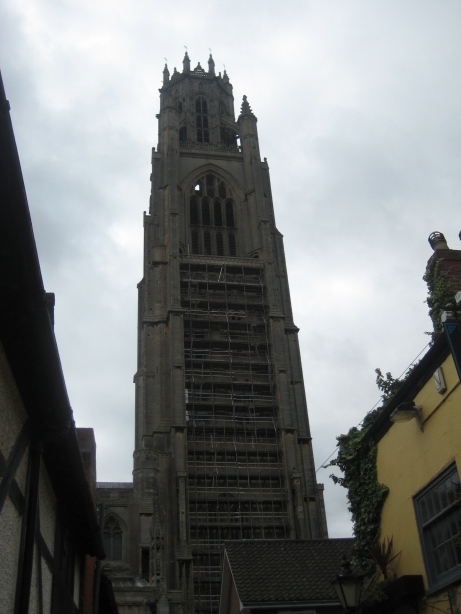 I particularly remember the tall tower of the principal church in Boston rose up above the town, as it reminded me of The Two Towers. It’s now just a week until I complete this journey. For the last leg I shall be cycling from the Greenwich Foot Tunnel (South side) back to Canterbury. I’ve arranged for bike ride organised by Spokes East Kent Cycle Campaign (of which I’m on the committee) to coincide with this. The Spokes ride will start from London Bridge station at 08:00 on Saturday 22nd. It’s open to everyone, so if you’d like to accompany me on the final leg then why not pop along? They’ll meet me at the Greenwich Foot Tunnel after following NCR4 from London Bridge station. For details see the Spokes website. I had a friend come along and cycle most of the leg with me today. We started out on a quiet road and soon the route used a few rough bridleways before weaving to the road again. The route passes through many small villages going up and downhill in the process, but after Walesby it proceeds downhill to the flat. In one of the small villages we discovered a section of NCR12, so I cycled a short section of this to make sue it’s marked on the map. At Market Rasen we stopped off for a pub lunch, then weaved our way through a few more villages to Lincoln, where my friend departed by train. I then continued eastward, still following National Cycle Route 1, using a former railway route between the river Witham and an irrigation ditch. With the exception of a short road and short bridleway section this continued all of the way to Woodhall Spa. 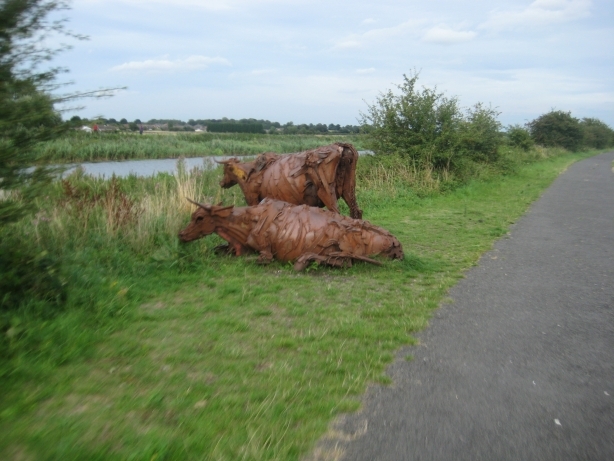 Along this route are a number of artworks of plants and animals together with lots of interpretation boards about the fen landscape and its wildlife. Unfortunately I continue to be without Internet access, so the blog postings are piling up, as will no doubt my emails. I’ve ran out of downloaded mapping data with which to edit, so can’t enter any more of that as well. Hopefully I’ll get Internet access soon; this is frustrating. Today’s route quickly started off heading through Selby before heading out beside the river Ouse to the flat countryside. 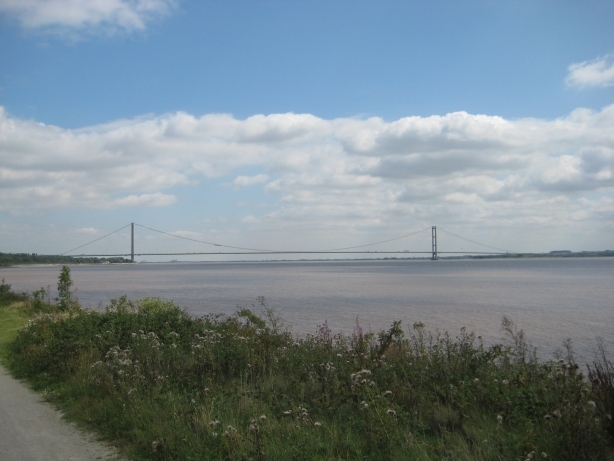 The Ouse eventually joins the Humber and several miles downstream I crossed via the Humber Bridge into Lincolnshire, with my accomodation being a few miles further on. Fairly early on during my ride today I met another cyclist with a GPS heading in the opposite direction. It turns out that he’s cycling from Brighton to Thurso and has performed much of his planning using Memory-Map, like me. We discussed his route northward and I told him about the OpenStreetMap project, which he hadn’t heard about, and gave him a card about my ride. He said he’ll take a look once he gets back home again. Unfortunately the Internet access at today’s accomodation isn’t quite working. It connects to the WiFi perfectly fine, it also connects to the ISP, but it’s evident that I can only reach a few hops into the ISP’s network before everything vanishes — I can’t reach the wider Internet. It’s particularly annoying because I’ve got a rest day here and I’m hoping to catch up on the backlog of mapping data entry, emails, etc. I’ve been very lucky to have great weather for at least part of my time in each of the national parks that I’ve passed through. 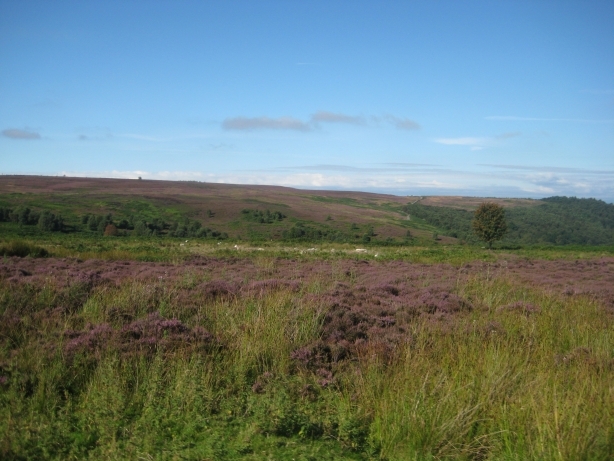 This continued to be the case for my departure from the North York Moors National Park. My journey started off via a traffic-free track then took in some quiet roads. 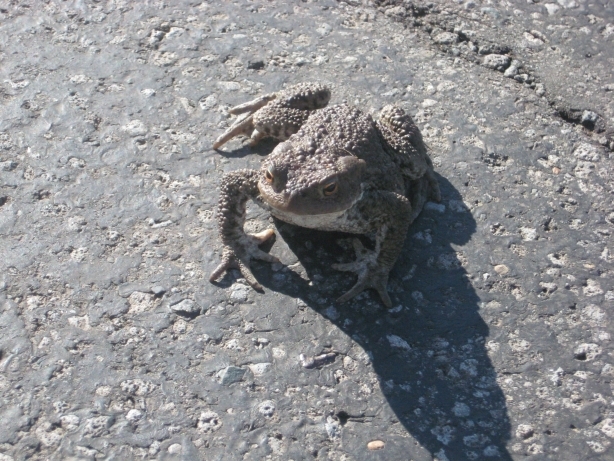 At one point I stopped to take some pictures and spotted a frog on the road. During my journey I found three portions of the recently renumbered NCR656, which I found a little confusing. They all lead off to the east from the route I was following, so this confused me — I thought that a point of the renumbering was to remove the ambiguity of braids with the same number, but this suggests that NCR656 is itself a braided route. I also discovered a portion of NCR657. I’ll get these entered into the OpenStreetMap data once I manage to catch up with my data entry and get Internet access again. The cycle route between York and Riccall follows a former railway. It’s one of the earliest such cycle routes in the country. It has a scale model of the solar system along its length, developed by the University of York, which gives an appreciation of the completely different distances between the inner and outer planets. At my accomodation I was unexpectedly given a 1955 map of the York area, after mentioning my interest in maps. Another surprise was being invited to a BBQ being held that evening.